Back at the near bottom of the February 10%+ correction I looked to the history which said 10%+ corrections in February take 125 days on average to return to old highs. Well we are right on track (not counting the Dow 30 which failed to be a relevant market index about 20 years ago. I said then as I say today that ultimately the MACRO economics in the United States would be the winner at the end of the day and the 22-24% earnings boost from corporate tax cut + $1 trillion of stock buybacks that amateur investors rushed and chased with the January 401-ks and bonus money would, after the too-far--to--fast January melt-up was corrected, carry the day. Soon thereafter POTUS Trump started beating the trade war drumbeat and we got another fear into the market (and I will be the first to admit I had no idea how the market was going to react since we have not had a real global trade war in may many decades). Well as we know now the capital markets figured out that our reality TV star Chief Executive is using his mouth and his Twitter account to talk a big game but, in the end, the huff and puff from the mastr of the "Art of the Deal" is just that--dramatic gestures and words. With the reality of losing the House in Congressinoal elections in November comes bad news for the POTUS and Republicans. The "shocking news" that POTUS's team of trade negotiators has now agreed to conduct serious settlement talks with China (in this scenario) was to be expected (as a miraculous settlement with the EU and Britain will undoubtedly be. My point is if we 1) understand what drives American policy under Mr. Trump b) Understand that with Mr. Trump drama is his favorite currency and tactic and c) at the end of the day the Art of the Deal is a highly predictable of outrageious rhetoric and threats followed by more fearful talk and threats and boom--it's over and victory and "winner" is declared no mater the outcome. Use long and short index and stock specific options to protect profits, hedge macro events and take advantage of short-term pullbacks within overall up-sloping trading ranges in our favorite stocks. Be ready to GO DEFENSIVE and lock in our 275%+ gains since June 2013 to build cash when our TR Macro Market index shows high recession risk/bear market risk 4-6 months ahead. Observation: How to Save Yourself from the Daily Brain Damage of our late stage 7-8th inning stock market. To understand the daily gyrations of fear and greed in the US stock market, I find the analogy of a single lens reflex or adjustable lens camera helpful. The day-to-day shifts of fear, worries, confidence, and ebullience of the stock market is really a reflection of the lens the majority of investors choose to view market risks and strengths with THAT DAY. On fearful days, the short term traders (who are the marginal sellers on fearful days along with scared private investors) zoom their "lens" and only see the potential "bad stuff" in the market. They see the worst case scenario or the think other investors will start to and they close out positions. You see this behavior caused by trade war tweets. We saw this last week with Turkey and their crashing lira currency. Fear of a systemic economic "contagion" takes over and, of course, European banks that have lent huge amounts to Turkey in euros crater as again, the worst case scenario is seen as the traders "lens" goes from wide angle to ZOOM and only focus on the fear of contagion. What Turkey has to do with American companies, however, I can't tell you because its the 34 out of 35 ranked OECD countries with the GDP of just 1.4% of the global economy or roughly the GDP equal to the state of Illinois. Magically the European Central Banks will figure out (like Greece with the GDP of Utah) how to stop the bleeding and fundamentally, U.S. stocks have robust second-quarter/third quarter/fourth quarter earnings near 22% year-over-year to thank for their fortitude. In fact, with 86% of S&P 500 companies having reported quarterly results, second-quarter earnings are up more than 24% year-over-year while sales grew more than 9%. Outstanding corporate earnings have played a critical role in bolstering investor confidence and it may be worth noting that none of Bank of America’s sentiment barometers which I follow—including the Bull & Bear indicator as well as the Sell Side indicator—point to a top in markets as of yet. Meanwhile market sentiment is just right — not too hot nor too cold aka Goldilocks. Key Point: To finish the analogy, IF you keep your market lens WIDE and don't zoom down on a specific tweet or inconsequential foreign country 1) the US equities markets HAS been the best performing 2) will continue to be the best performing 3) with a very reasonable forward earnings market p/e of 14.8 (vs. 17.2 average) largely because the biggest companies had their effective tax rates cut to 14% ish AND the repatriated $1.5 trillion in cash from foreign subsidiaries and are buying back/reducing the float of available stocks by $1 trillion or about 7.5% of the entire value of the stock market. Said another way: WHEN you add up the reduced shares outstanding AND cut the effective tax rate by 40% AND overall top-line revenues are up an average of 9% in 2018...you get earnings-per-share growth year-over-year of....drumbeat..about 22-24%! without doing a damn thing!! And...if you don't own "the market" but the very fastest top-line and bottom-line companies with very high profit and operating margins, your portfolio too can be up 48.2% in an overall market up 6.8% for the year. Transformity MacroMarket Index: 17.9 or <2% risk of US recession in the next 4-6 months. BULL MARKET INTACT for the rest of 2018! The New York Fed Staff Nowcast for 2018: Q3 stands at 2.4%. News from this week's data releases decreased the nowcast for 2018: Q3 by 0.2 percentage point. Negative news from housing starts accounted for most of the decrease. What about inflation--the Fed's preferred inflation index the Trimmed Mean PCE continues to hover around 2%. Hourly wage inflation is benign because, whilst there are hundreds of thousands of new hourly wage jobs being created, they are being filled in many cases by younger workers at the low end of the wage scale, replacing older workers at the high end of the wage scale. Corporate tax cuts going to working-class labor as promised? Not so much. Lower gasoline prices mean more to the pocketbook and tariffs have so far not made a real difference. Wal Mart just reported 10% year-over-year sales growth...THAT is the indicator we use to gauge the economic health of the working class household. With inflation contained and a lid on longer-term interest rates at 3% (due to heavy demand for 3% 10-years US Bonds with the dollar rising in value--that gives an extra kick to foreign buyers on currency gains + 2.5% higher yield vs. German or Japanese 10-year bonds) the economy should continue to be robust over the longer-term UNLESS we have the trade war flat wrong. All of these fundamentals and below trend valuations are bullish for stocks. Additionally, with the overall market trading a relatively cheap valuation on a historical basis when looking at earnings, estimates, the continuation of relative low-interest rates should allow for further multiple expansion of earnings. 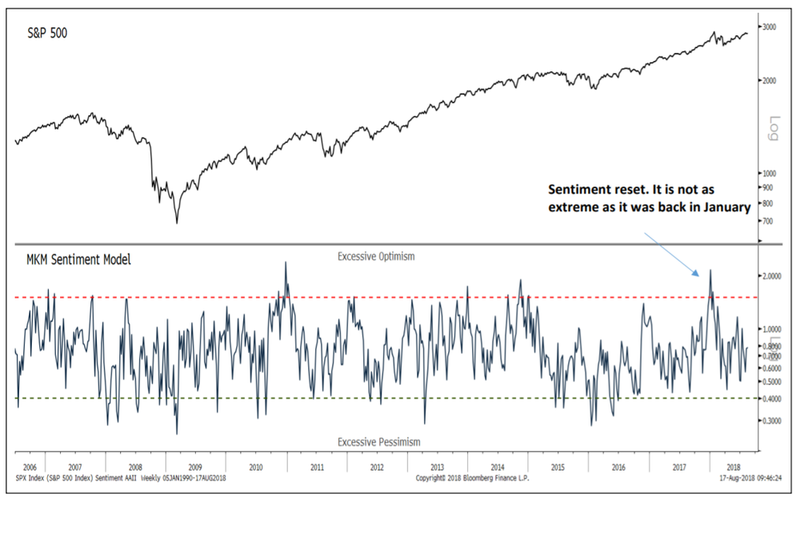 At this point, the equity market looks all primed to continue to rise over the short-to-medium term. We have owned Lam Resarch and Applied Materials, the two big kahunas in the space since late 2015 and early 2016 and ASML and ACLS since mid-2015. Revenues began their 10% quarter ramp in late 2015 and have not stopped...till a few weeks ago. We got it perfect going in (our forecast on OLED and NAND/DRAM memory demand exploding with limited capacity to expand production and have been rewared with 140% average gains (all blended). But our semiconducter industry spies and my team have been about 2 months LATE is updating a revenue and order pull back...and it has cost us with the 20% is pull back. Applied Materials and Lam Research, the two largest companies in the group by annual revenue, have both lost about 19% of their respective market values over the past three months. A big drop came Friday after Applied Materials posted its fiscal third-quarter results, and then said the sector would be weak through the end of this year. Crap. No one to blame here but us--we failed to see the Q3 and big Q4 revenue slow down (18% down in Q4). The culprit? Semiconductor equipment companies live on the capital spending of chip makers. That spending has been cyclical historically and has seen a big upswing over the past couple of years thanks to booming demand for components like memory chips. But nothing lasts forever, and two of the world’s largest chip makers—Samsung and Taiwan Semiconductor Manufacturing —appear to be trimming their outlays again. GOOD for chip prices (MU NVDIA AMD) but bad for WFE (wafer equipment) sales. I learned this lesson a LONG time ago--you have to get the WFE cycle right to get in and get out. We got the upcycle on the nose...but not this downcycle. In late-July, TSMC lowered its projected capital expenditures by 13%. Samsung hasn’t formally changed its projected capex yet for this year, though several respected analysts have reported the company delaying equipment orders as it adjusts its manufacturing operations. Why is this so important? Because Samsung and TSMC combined accounted for about 46% of the chip industry’s total capital spending last year, according to estimates from Wes Twigg of KeyBanc Capital Markets. The question now is whether the recent weakness is simply a blip or the beginning of a more sustained downturn. Applied still maintains that it is more of the former. The company projected a 4% year-over-year drop in semiconductor system revenue for its fiscal fourth quarter ending in October and effectively said the following quarter ending in January would show an 18% decline on a year-over year basis. On a conference call with analysts last Thursday, Applied executives said they expect growth to resume after that. FOR one thing, it helps that chip makers like Intel and TSMC are racing to update their manufacturing processes to 10nm and 7nm wafer density (and great for us that AMD is already AT 10nm and bringing out its 7nm chips at least one YEAR ahead of Intel). 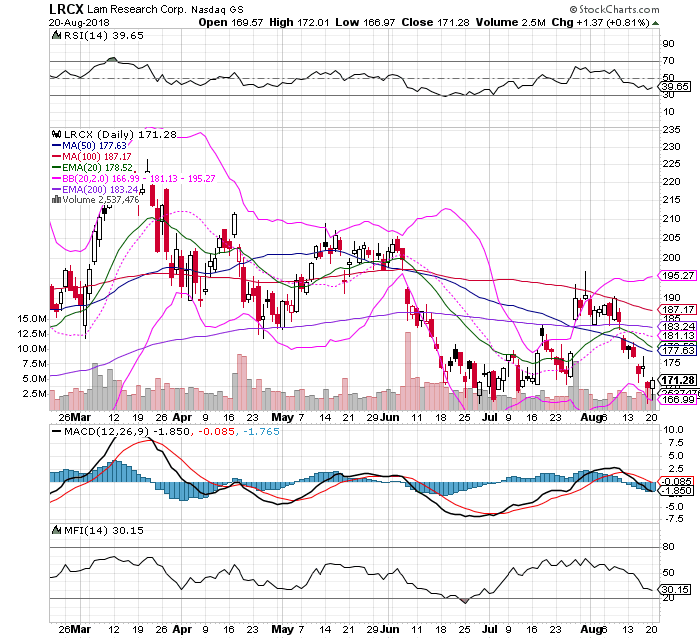 Action To Take: SELL STOP on LRCX at $165 and AMAT at $41--they are both WAY oversold and at the very bottom of their trading range. SELL ACLS and HOLD ASML (ASML upped their guidance goes into 2020--they are sold out on their $400 million lithography wafer etching machines through 2019). Bottomline: Most of us have big profits with AMAT and LRCX and 50-60% profits with ASML--the smart portfolio move is let the value investors come back from the beach after Labor Day and see if the value investors (if they have any money left) have an appetite for the NEXT WFE cycle. With both selling at an 8-9 price/earnings ratio, long-term value investors should be licking their chops here with 2 slowing quarters already priced in. The smart move is to let the market action take us out if prices collapse and the value buyers do not set a floor here. We WILL buy long-term options on both these namesIF we see a real washout with relative strength below 30. The charts tell the sad story and I APOLOGISE for missing the cycle turn. We miss very few tranformational cycle turns...but when we do I'll take the blame. ﻿Micron (MU) is a buy here under l$54. Lower WFE sales to foundries mean supply-demand balance for their memory chips and SSD memory drives stays healthy. I'm a few days away from pulling the trigger on $54 January 2019 call options to make ANOTHER killing on MU options. For many of us our cost basis on Micron MINUS call option income and put option profits is now literally at or below ZERO. At a 5 forward p/e and a pullback in memory equipment sales and NO pullback in demand for their 3D NAND memory and SSD drives for hyper datacenters driving AI, machine learning and soon autonomous vehicles they are still in the sweet spot. That's it for Part 1: Part II out as soon as we to valuations and forecasts on our remaining positions. We are going to add 3-4 new Ultra Income plays and finally prices on the Enterprise SaaS stack players corrected and they have bottomed as well. There is some key sector rotation going on here into healthcare and 5G plays plus some transformational retail and regulatory shifts that we can make great profits from--stay tuned!